The Automata Workshop is a single-session campaign, something that should fit in a few hours of gameplay. In this campaign, the players are insurance adjusters for GECKO, the Gnomish Enterprise Conglomerate Karma Observatory. GECKO is headquartered in the Gnomish city of Choam, the capital of the Gnome nation and the pride of its people. The gnomes of Choam are progressive, perhaps to an extreme. They experiment heavily in mechanical ingenuity and magic-assisted machinery. The outskirts of Choam are a toxic wasteland to the north, a hilly tundra of discarded experiments, magical byproducts, alchemical runoff. Scattered throughout, the twisted creatures grown from this malignant stew roam unfettered, making even the most cursory exploration a challenge of distressing proportions. To the south, the Choam Guard keep the abominations at bay and the roads free for travel. The great road curves up to the city, paralleled by the first train tracks. The train line goes to nearby cities, and is constantly being expanded. Players are insurance adjusters for GECKO, with the general mission statement to verify insurance claims and to check that the policy guidelines haven’t been violated. Given the diverse creative efforts of the inhabitants of Choam, such an endeavor is fraught with danger and the adjusters must needs be heavily armed and prepared for anything. In this mission, the PCs are asked to investigate an insurance claim made by the Automata Workshop, a company responsible for many of the semi-autonomous guards in the city. The Automata Workshop has suffered a massive explosion that annihilated one of their two primary workshops. The claim wants a full restitution of materiel and life insurance on the inventors killed in the blast. GECKO policy is to make a full examination of the premises in case a policy violation is being hidden by the company. In this year of 1251, the Gnomish Enterprise Conglomerate Karma Observatory, hereafter referred to as GECKO, does extend the following provisions of relief to the holder of this document. Section 1 – wherein the guidelines of lawful obligation are described. PROVIDING the holder does not engage in overt espionage against GECKO. PROVIDING the holder follows all guidelines of Section 2. PROVIDING the holder meets all fees on time and in full. PROVIDING the holder is positively identified as laid out in Section 3. Section 2 – wherein the disavowal clauses are outlined. The holder must have registered GECKO documentation approving of all extra-dimensional forces and beings used in experimentation or labor. Any magical forces must not exceed a radius of 20 feet or a length of 60 feet. Damages caused by provable employee negligence are void of insurance. Any employees that have an expired contract, or had a contract expire within the 30 days preceding the accident are automatically considered negligent. Personal damages are not covered. Property damages caused by experimentation are covered except where such experimentation results in disintegration of matter. Explosives exceeding 3 million megatons (that being the calculated total required to collapse the Underdark). It should be made clear to the PCs that their objective is investigation. This is not a go-in-swords-swinging type of adventure. There will be combat, of that there is no doubt, but the initial approach of GECKO adjusters is to assume the company is law abiding until proven otherwise. The Automata Workshop is on the eastern border of the wastelands, with the pestilential hills visible over the low walls surrounding the property. The walls have embedded force wall generators that can be triggered in case of an abomination attack. The entrance to the Workshop is guarded by a pair of gnomes with long repeating rifles, twice as tall as they are, and dressed in uniform studded leather armor. Waiting with the two guards is Cheedy Floostan, ready to receive the adjusters. The Workshop itself is a massive rectangular stone building with recessed arrow-slit windows fitted with gnomish glass. The left wing of the Workshop is marked by glass shrapnel from the explosion, with smoke damage trailing up the walls above the windows. Floostan exhibits a degree of nervousness that isn’t difficult for the PCs to uncover. A medium-difficulty check reveals that Floostan is hiding something. After verifying the adjuster identity, he leads the group into the Workshop. The left wing of the Workshop has a ring of wrecked workbenches around the circumference of the room. A few greasy stains of ash mark where inventors were standing when the explosion went off. Investigation of the wreckage identifies it as alchemical workbenches, the reagents neutralized by the heat of the explosion and no longer dangerous. A medium-difficulty investigation check reveals that amongst the wreckage are the bars and hardware of a large cage. 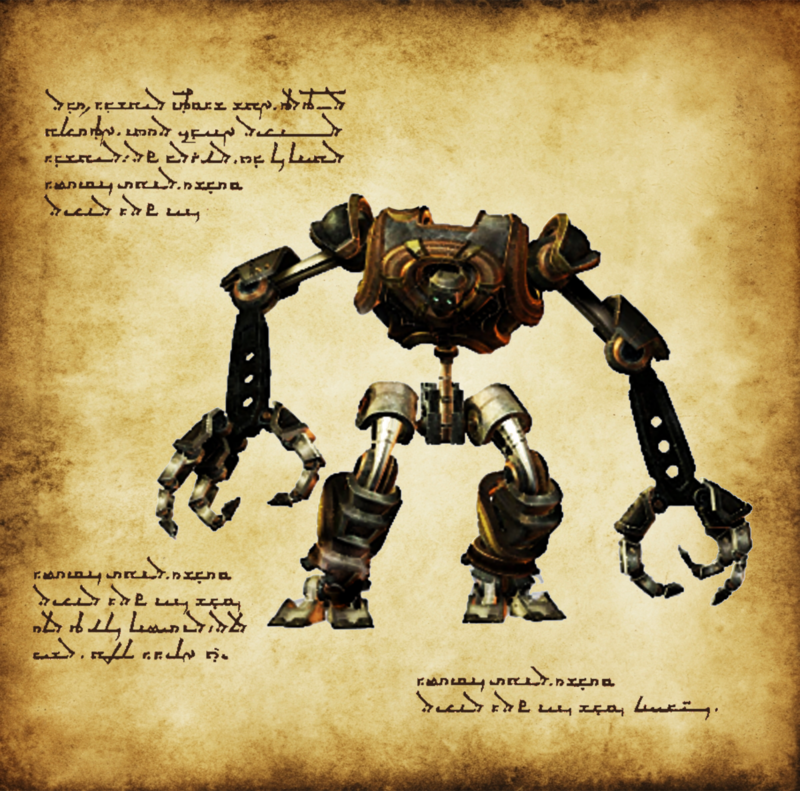 A difficult alchemical knowledge check shows that the automata produced by the Workshop are alchemical-based, not magical golems. A medium-difficulty alchemical check shows that the explosion is alchemical, not magical, and doesn’t violate the terms of the contract. The right wing of the Workshop is guarded by a pair of uniformed guards like the ones standing post outside. They attempt to block passage of the PCs, and the players either need to bribe/threaten/convince the guards to stand aside, or go back to Floostan and convince him to let the PCs past the guards. When the PCs enter the room, the guards close and lock the door behind them and the PCs are attacked by a swarm of small automata, in a medium-difficulty encounter. A perception check of medium difficulty reveals the automata in hiding amongst the workbenches, otherwise, the automata get a surprise round when the PCs reach the center of the room. 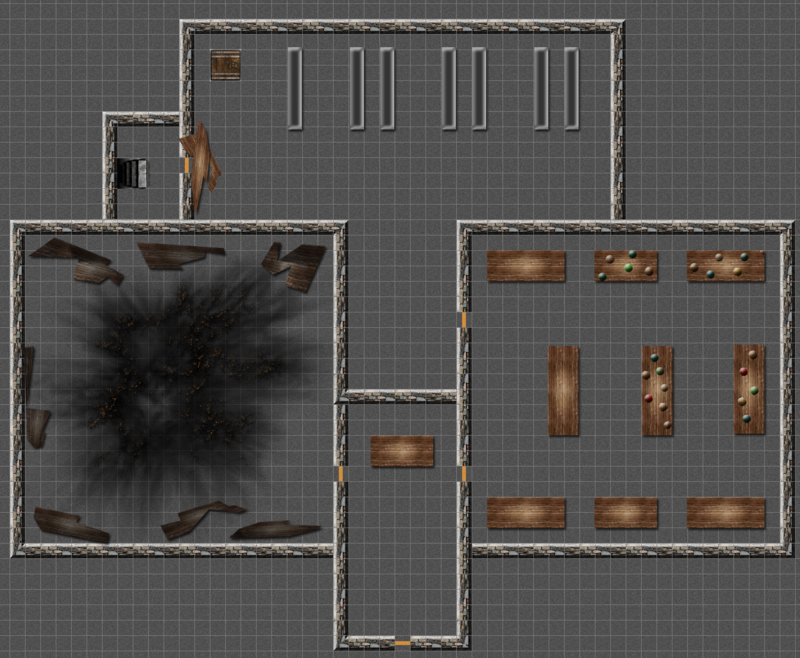 This workshop is intact, and after the combat is resolved, the PCs can examine the benches. The alchemical technology being employed requires a very difficult alchemical check to discover that the automata are self-created. Lower failures on the check just show that the automata are unusual and ‘new’. Without guards to hinder them, the players are free to move back to the rear of the Workshop, though the door has a medium-difficulty acid spray trap on it. The warehouse racks hold pre-constructed parts for the Workshop’s general products, along with an assembly area. The PCs are attacked by a medium-difficulty encounter of medium-sized automata. The automata are piecemeal, constructed at random it seems, some composed only of arms, others with too many heads, jumping around on one leg, etc. After combat is resolved, looting the bodies of the medium-sized automata discovers a single undamaged alchemical core. The core tries to attract undamaged parts to it. If nobody stops it, it reconstitutes into a new medium-sized automata and attacks the PCs. If they attack carefully (5e with disadvantage, etc) the players can dismantle the automata without damaging the core. Experimentation with the core reveals that it seems to have an intelligence of its own, if rudimentary, and had the ability to reconstruct itself if damaged but not destroyed. 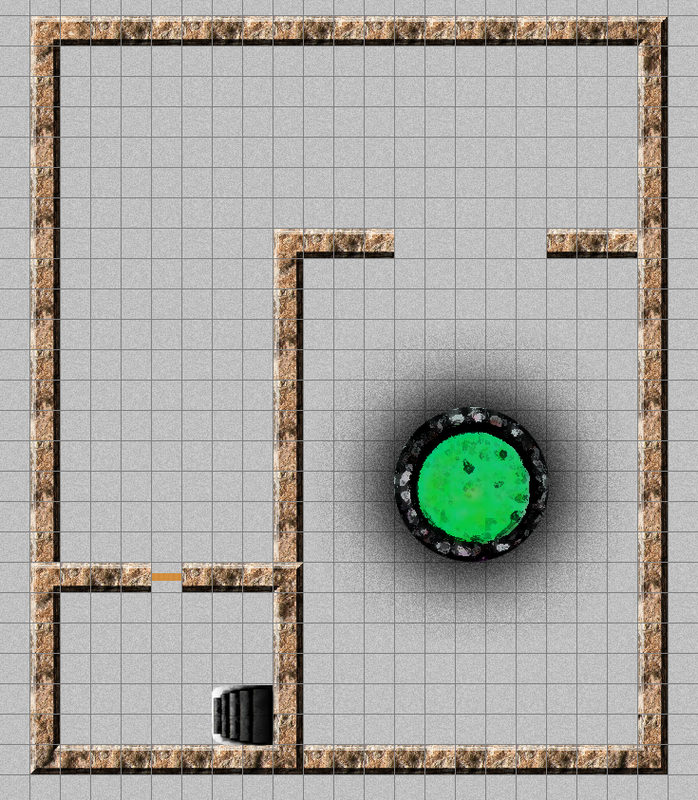 There is a trap door covering a waste chute, from which the sounds of something very large moving around comes faintly to the players. A locked cabinet holds racks of inactive cores. A difficult alchemical check reveals that the cores require a liquid reagent to ‘fuel’ them. There are empty containers of reagent, presumably the source of the uncontrolled automata. There is a heavily barred door with filing cabinets and tool racks pushed in front of it. The basement is unlit, echoing and dripping with groundwater tainted with pollution from the wastelands. There are two points of entry to the basement, either through the waste chute or down the barred stairway. Entry from the stairway brings the PCs to the bent L hallway, with a large automata pacing back and forth. This encounter is hard. Rappelling from the waste chute lands the PCs in the central room. The central room has a well in it, from which rises a mingled alchemical and magical corruption which fuels the cores with malignant energy. The center of the room holds a huge automata, too big and ungainly to be effective in combat, but none-the-less hostile. Discovery of the huge automata provides the proof that the Workshop is in violation of its insurance policy safety clause, specifically on the ‘don’t create a doomsday device’ clause. Self-replicating, hostile automata certainly falls under that category. The PCs aren’t obligated to destroy the huge automata, but if they attempt it, it is a deadly encounter. Since the automata can’t move, the players can retreat as needed. With proof acquired, the dungeon is essentially complete. The players can confront Floostan if they want, but it’s unnecessary. The reward for completing the mission is a monetary reward, basically a percentage reward for finding proof that the Workshop is in violation of its insurance policy. Scale it to fit the player level as appropriate. Floostan is a gnome of medium stature with a tremendous bristling beard that he has stained a bright blue. His mustache extends in waxed points six inches beyond the sides of his head. He wears a robe decorated with exhaustive needlework and braiding, as well as an impeccable bowler hat. Despite his magniflorious appearance, he seems nervous, sweaty, and prone to flinching. Things have not gone well for him in the last few days, though he is straining to put a brave face on the situation. The guards working for the Automata Workshop are dressed in a suit of uniform studded leather armor, dark grey set off with brilliant blue highlights. They are armed with long repeating rifles, gnomish inventions using an alchemical-based gunpowder. The laws of physics dictate a minimum length of rifle barrel which leads to the weapons being comically oversized for their diminutive wielders. Be wary, though, for despite their disproportionate weaponry, the gnomish guards are fiercely protective of their business. Statistically, the guards have ranks in Ranger, or the equivalent, and are competent warriors in their own right. If the PCs insist on engaging them in combat, the fight should be deadly. These automata are small, around three feet tall, composed of a head surrounded by a melange of arms and legs in no particular order or logical attachment. They move in hops and bounds, occasionally skittering about in quick bursts. Their primary weapons seem to be sharpened metal stakes or perhaps shards of sharpened metal scavenged from spare parts. They show a modicum of intelligence through planned ambush, but exhibit no other signs of communication or planning. These automata are man-sized, and seem complete. They are not scavenged or piecemeal, and have the correct number of appropriate limbs placed in the normal positions. They are in various stages of dress, like they were being prepared for deployment with the colors of their owners before things went wrong. They attack with standard weaponry, swords, spears, etc. These automata have the appearance of a many-legged tiger, with an oversized human head and too many teeth. It has a pair of human arms erupting from its spine, like wings on a dragon, with which it makes clawing attacks to accompany its bite. Attacks with claw, claw, bite. The huge automata is basically just a pile of spare parts, too big to move on its own. Due to its proliferation of limbs and heads, it gets a separate attack against every adjacent enemy each turn. Ranged attacks against the huge automata are ineffective. One must get in close and physically tear it apart (with weaponry) or perhaps detonate large explosives in and around it. Magical attacks will work as usual. This is nominally a job for the city Guard, but if the players insist, can be done by hand at great risk.